Building a Solar Cooker is easily accomplished With the right resources... we would like to help you find the best ones for your ideal cooker. 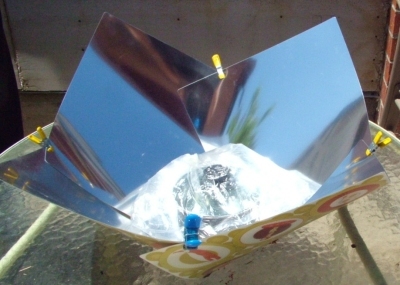 There are many sites available on the internet that offer plans for building a solar cooker. Some plans are quite simple and others are a bit more complex in design and more involved in their use. Check out our YouTube video below and see how to construct a solar cooker. See what others have built and how they did it. 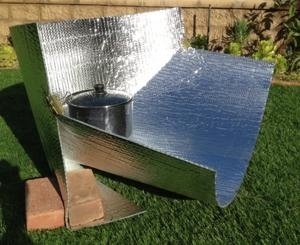 Do not let the simplicity and the rustic looking nature of a homemade solar oven fool you though, just because they are made from ordinary, common, everyday materials does not mean that they can not cook. 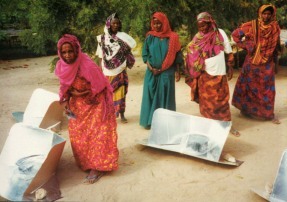 Most well built homemade solar cookers can cook about anything you can imagine. 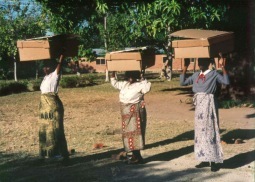 Several books have been written on solar cooking that include plans and information for building a solar cooker from these common everyday items. Due to the scope and complexity of accumulating and illustrating the large numbers of styles and varieties available, we offer a good source for solar oven plans. 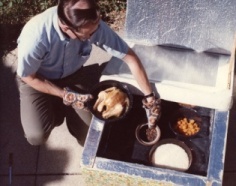 Another very informative site for home made solar oven plans is found on The Solar Cooking Archive at Solarcooking.org which also sponsors a Wiki about solar cooking. All of the plans on the above mentioned site are designed and built by individuals and organizations, some are proprietary and require permission to use, sell or distribute but the great majority can be constructed and used by anyone, this being the purpose behind the display and dissemination of home made solar ovens and solar cooker plans on this site. All of the plans are very functional and can be used to attain great results for most any cooking need. These plans offer a great opportunity to also teach students, scouts and other groups the principles behind solar energy and its uses for practical application in the art of solar cooking. 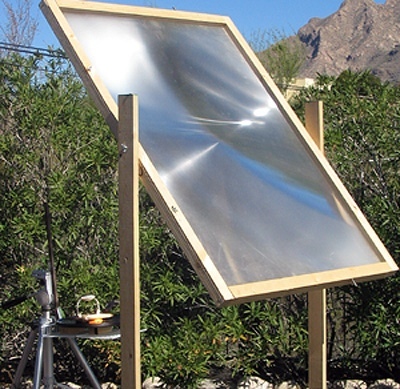 Have you already built a homemade solar oven? How did it turn out? What things did you do well and what things did you do...well, not so well? Another site for the handy person, especially those who like to build things with their hands and use blueprints and plans to create a solar cooker work of art.This is an excellent and attractive design for a parabolic cooker. 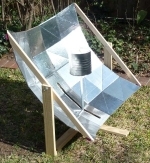 This site shows how this group used a simple, yet effective solar parabolic design using a cardboard box and reflective material for making a parabolic cooker based on the Hallacy Design from Dan Hallacy's book, Cooking With the Sun. SolReka, based in Great Britain, also has a very handy and precise template for building your own parabolic solar cooker. The template allows for unlimited construction of your own parabolic cookers. You provide your own readily available materials such as cardboard, foam board, chloroplast, reflective material etc. For those who are pretty handy with tools and plans and really like to make something that will last, you can get great information on home made solar cookers on a favorite site of mine. You will find quite detailed instruction on how to build a solar oven with materials that are readily available at the local home improvement store. This gentleman has been involved in solar cooking for quite some time, so he speaks from experience. 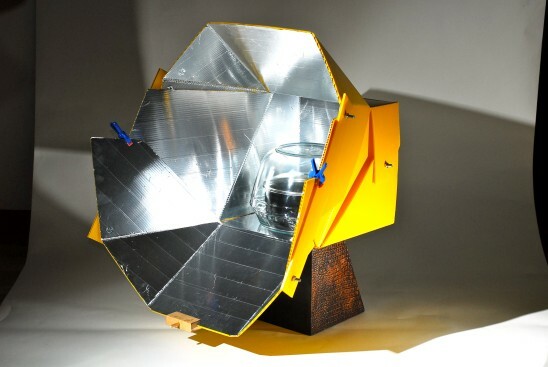 Likewise for this gentleman, David Omick, who has designed and built a very nice and very effective solar box cooker...very well made. 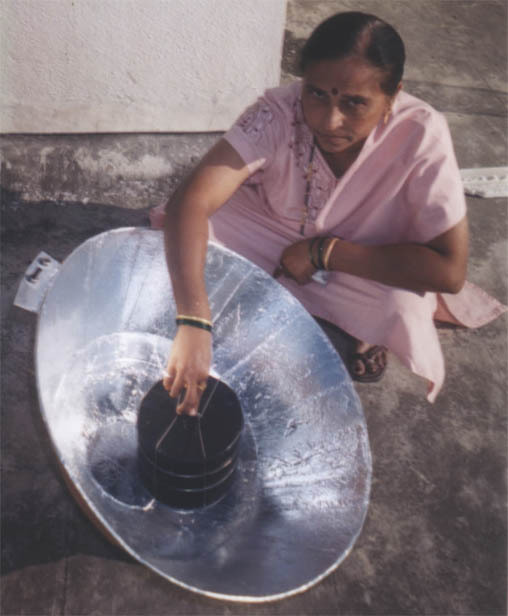 This design is by Solar Cookers International and is called "The Minimum", a very simple and inexpensive solar box cooker. The panel cooker is quite possibly the simplest to make, and the most economical of the three types of solar cookers, yet it can be just as effective at cooking as the other two previously mentioned cookers. Because of the ease and simplicity involved in its construction, there are an abundance of solar cooker designs and solar cooker plans available for the panel cooker all over the internet. Here is a nice and very effective solar panel cooker that comes in a ready made kit form that you just have to assemble and start using right away. You can purchase the ready made kit for a very nominal cost. Here is a variation on a couple of styles of solar cookers. 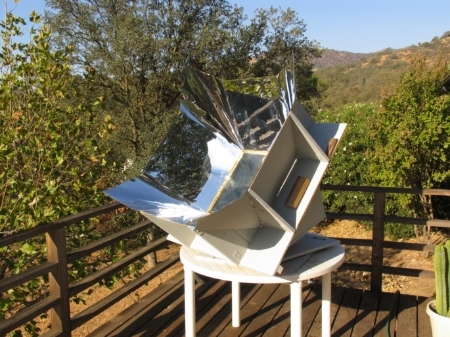 You have a mix of panel along with parabolic trough style cookers combined for a very effective solar cooking mechanism. For those who would like to purchase a Fresnel Lens to make your own "concentrator cooker" you can contact dealer Paul Lennon for details, cost and shipping information on his product. Fresnel Lens order info. Note: With any and all solar cooker plans and designs, links, pages and instruction shown here on our site and elsewhere, time and effort should be given to patiently read and analyze the information presented; whereas some instruction tends to be more understandable and clear than others, due to the writing and organizational skills or lack thereof, of the authors. 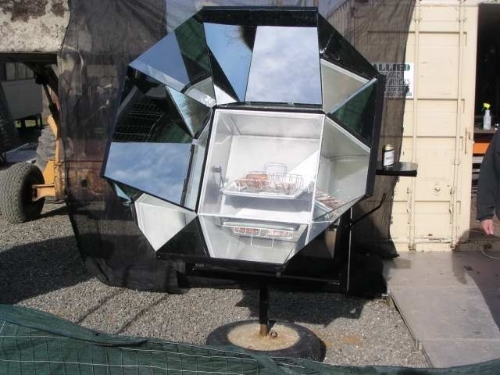 For those who are also interested in a high quality manufactured solar cooker, please visit our Solar Ovens Comparison page to find out what is offered on the solar cooking market.